The MN DNR Enforcement Division has regulatory oversight of Minnesota’s Taxidermy Industry. Taxidermy is the method of preserving or mounting either whole or in part, a wild animal using the skin or skeleton. The information on this website is provided to assist taxidermists and other’s interested in taxidermy with a basic understanding of Minnesota’s Taxidermy Regulations, as well as examples of taxidermist reporting forms and tags. If you have specific questions regarding taxidermy regulations, contact your local Conservation Officer. Who needs a taxidermy license? If you preserve and or mount, both whole or in part, using the skin or skeleton of a wild animal, and receive compensation for your work then you need a taxidermy license. How do I get a state taxidermy license? A Federal permit? Contact the DNR License Bureau for an application by calling 651-296-6157 or toll free 1-888-646-6367, or visit our website at mndnr.gov/contact. 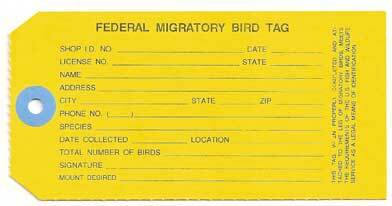 Do I need a Federal permit to mount migratory waterfowl? If I am a taxidermist do I need a tanner’s license? Maybe. If you are only tanning hides associated with the mounts you are working on for your own customers then you would not need a tanner’s license. 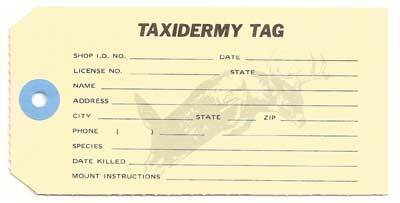 If you are tanning hides as an exclusive business or tanning hides for other taxidermists then you would need a tanner’s license. What records are taxidermists required to keep? MN Statute 97A. 425 (https://www.revisor.mn.gov/statutes/?id=97A.425 ) requires licensed taxidermists to record the names and addresses of persons from whom wild animals were obtained and whom they were transferred; the dates of receipt, shipment, and sale of wild animals; detailed descriptions of the number and type of wild animals purchased, sold, and shipped; serial numbers of seals, tags, or permits required to be attached to the wild animals; trapping license numbers for protected fur-bearing animals, unless the trapper is exempt from the license requirement, which must be noted. How long do I need to keep my taxidermy records? A taxidermist is required to keep records for 2 years. Do I have to allow the inspection of my taxidermy records? Yes, the records of a taxidermist must be available for inspection by a Conservation Officer at all reasonable times. If an animal is dropped off at my taxidermy business and I fail to get the customers information is that animal now part of my personal possession limit? Yes. Any unmarked animals in possession by a taxidermist will be considered to be part of their personal possession limit. What do I do if a customer brings an owl to my taxidermist shop? Contact your local Conservation Officer. If a customer wants you to mount a hawk, owl, song bird or any other species that is given total federal or state protection (i.e. no open season or legal taking) it must be accompanied by a seizure / confiscation tag issued by a state conservation officer or a federal fish and wildlife agent. Possession of these animals or birds without proper documentation is illegal. How do I contact my local Conservation Officer? Go to mndnr.gov/officerpatrolareas to locate a Conservation Officer near you.